Irritable Bowel Syndrome (IBS) is a chronic intestinal disorder for which there is no known cure. The symptoms of this disorder include diarrhoea, constipation, cramping, excess gas and severe abdominal pain. Since these symptoms can be painful, embarrassing and can often come on with no prior warning; living with IBS can be irritating and sometimes impossible. 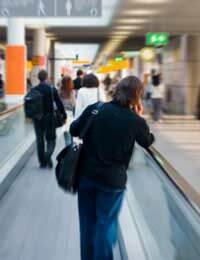 Since this intestinal disorder can interfere with normal daily activities because of the urgent need to use the bathroom, sometimes multiple times a day, many individuals with Irritable Bowel Syndrome also avoid the joy of travelling. However, with a few precautions in place, some well thought out planning and the knowledge of what to pack, travelling with IBS can be fun, exciting and stress free. Depending on the mode of transportation you choose for your holiday travelling, there are certain precautions and planning steps you can take to accommodate your medical condition and still have time to have fun. Contact the tourist information boards along your route and ask for a map that includes the location of bathrooms and rest stops. Plan your route to include as many of these as possible. And, if possible, plan your route so that you pass a restroom within one hour of each meal. If the highway or route that you have chosen does not include enough bathroom stops, reroute your travels to pass fast food areas, shopping malls, hotels or tourist information buildings since these locations almost always have public bathroom facilities. If you are travelling by car in a foreign city make sure that you know how to ask for the location of the nearest bathroom in the local language. Ask for the location of the bathrooms when buying a ticket and request a seat close to that location. Make sure that train has adequate bathroom facilities in case one should become unusable and make sure that passengers are free to roam the train in search of alternative bathrooms. Be sure to ask if the bathrooms are free or if they will require coins for operation. You do not want to be stuck without exact change when the urge to go overcomes you. Before purchasing a ticket inquire about the meals that will be served on route and ask if menu items can be changed or substituted if one or more of the items could trigger an IBS episode for you. Bring along snacks so that you can continue to eat smaller meals throughout the day and so that you do not have to rely on train food if you become hungry. Choose an aisle seat if possible. This will make it easier for you to get to the bathroom the minute you realise you need to go. Also, try to secure a seat as close to the bathrooms as possible. Before purchasing a ticket ask if there are designated times that you will be unable to leave your seat, for example, during take-off and landing. If so, ask if there are waivers for those with medical conditions like IBS. Inquire about in-flight meals before making reservations. If any of the menu items cannot be changed make sure that you pack some foods and snacks more suitable to your condition. Once you have your trip planned and your bathroom breaks scheduled you will want to make sure you pack any necessary supplies you may need on the road. Since public restrooms cannot always be trusted to be clean or well stocked, pack your own toilet paper, paper towels, toilet seat covers and hand sanitizer. You may also want to pack a few extra undergarments in this bag in case of accidents. Other good items to place in your bag no matter what your mode of transportation is are extra maps of the area for emergency bathroom location, extra medication for diarrhoea or constipation, medication for stomach cramps or abdominal pain like antacids or antiflatulents, a book or hobby to keep your mind occupied if you experience abdominal pain and your doctor's contact information. For increased piece of mind you may want to pack two bags with these items in case one should become lost or misplaced. If you will be camping or travelling in a very remote spot, you may even want to consider packing a portable toilet. This will help alleviate the worry you may have of not being able to find suitable facilities in a timely manner and reduce the stress you may experience that could trigger an IBS episode. Proper planning can turn travelling with IBS from nightmare to time of your life. However, to ensure even greater success there are a few things you may want to keep in mind. No matter how prepared you are you will not feel comfortable if your travelling mate is unaware of your condition. Prior to the trip explain your condition and the importance of frequent bathroom breaks and roadside emergency stops. Another great way to avoid unwanted stress is to plan your holiday for relaxation. Avoid pre-planned agendas that rush you from stop to stop or make you feel as though you can't keep up. Also make sure that you research your destination thoroughly before arriving so you will not be caught by surprise or overwhelmed by any events. Finally, make sure that you stick with your medication, meditation and dietary plans while on holiday. New foods may trigger an IBS episode so taste them carefully. And sleep disturbances, changes in eating schedule or missed medication doses can also trigger an Irritable Bowel Syndrome episode and upset your holiday plans. While travelling with IBS may take a few extra steps and a little extra effort, the outcome is more than worth it when you are able to avoid a stress free, IBS symptom free getaway. @Princess bird - I am sorry to hear this. It doesn't help that it can be bought on by stress and at the same time the condition itself is making you stressed. Have you looked into your diet? It might be worth keeping a diet diary so that you can slowly try to eliminate the foods that may be causing you the most grief, see Healthline link here. You may also ask your doctor to refer you for some allergy tests. Plus, if you are also suffering from anxiety and panic attacks as a result of this, it may be worth speaking to your GP about possible counselling sessions. I hope this helps. Hi, I am have recently been diagnosed with ibs, my mum and her sisters have it, but they keep telling me to enjoy life and don't seem to understand my anxiety, it's getting to the stage that I don't want to leave the house, I visited the doctor and she said it was an anxious stage in my life that would pass, I'm so angry at my body for doing this to me, I want to be a nurse but I am terrified that I'm going to allow this to ruin my life, what I'm asking is, is it possible for me to be a good nurse and live with Ibs? I feel incredibly depressed all the things I used to love doing i now can't due to fear like festivals, rides at theme parks, even going to crufts etc. I keep having panic attacks and don't no what to do anymore!